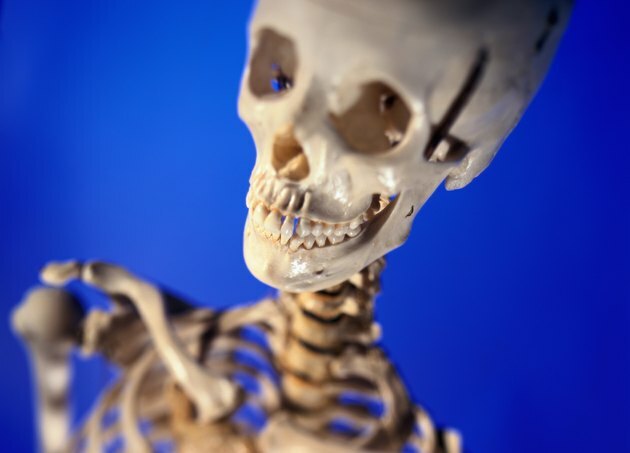 The human skeleton is composed mainly of a substance called bone, and there are primarily four types of cells that make up bone. These are the osteoprogenitor cells, osteoblasts, osteoclasts and osteocytes. Their names all start with the prefix “osteo,“ which is the Greek word for "bone." These are immature cells that are primarily located in the bone marrow and periosteum (membrane that lines the surface of all bones). They mature into the osteoblasts, another type of bone cell. These are the bone cells that are primarily responsible for bone formation. They only have one nucleus and are derived from osteoprogenitor cells. They function by secreting a substance called osteoid, which is also known as the bone matrix. This substance is then mineralized with substances like calcium and phosphate, which forms the substance we know as bone. When a group of osteoblasts is finished forming bone, they flatten out and line the surface of the bone. Henceforth they are known as “lining cells,” and their job is to regulate the passage of minerals, such as calcium, in and out of the bone. They also function by secreting proteins that regulate the osteoclast cells. These are the cells that are primarily responsible for dissolving bone tissue, also known as resorption. They do not arise from osteoprogenitor cells; instead, white blood cells that normally have immune system function (monocytes) fuse together to create the osteoclasts. As a result, they are quite large, with multiple nuclei, and are located in the endosteum (membrane that lines the inner cavity of the bone where bone marrow resides). These can be recognized by their typical star-shaped appearance, and are mature osteoblasts that do not secrete the osteoid bone matrix, but are surrounded by it. They have long branches that reach out from the cell body and communicate with neighboring osteocytes, and play an important role in maintaining calcium levels in body fluids. They do this by regulating the process of bone formation and/or resorption; since the bone is the body’s primary reservoir of calcium, they end up controlling the release/storage of calcium in the bloodstream. How Do Bone Stimulators Work? What Are the Functions of Columnar Epithelial Cells? How Does Bone Cancer Affect the Body?